Asolo’s goal is to create great footwear for all of your outdoor needs, in all conditions, at all altitudes: from light walking to hiking, from backpacking to the most treacherous climbing - whether it be on ice or mixed terrain. 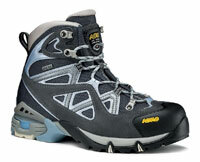 Asolo footwear is designed around the foot; flexible, lightweight, and at the same time, resistant. Fit and performance are our major strengths. Our breathable footwear is able to shock-absorb even on the toughest terrains, while keeping away humidity, water, and cold weather. 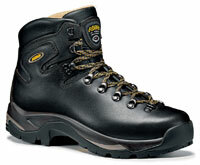 The highly researched soles prevent slips and falls on the most slippery terrains. Our shoes have no limits!!!! Our footwear has conquered the most important mountains in the world with our sponsored athletes, Tomaz Humar. For maximum head-to-toe outdoor performance, we recommend you always wear Asolo footwear with Lowe Alpine apparel, packs and accessories.